This is currently the only model offered by any brand which has the ability to accurately cook 2, 4, or 6 quarts all within one appliance. That means saved kitchen space and versatility for cooking different sizes and styles of meals. 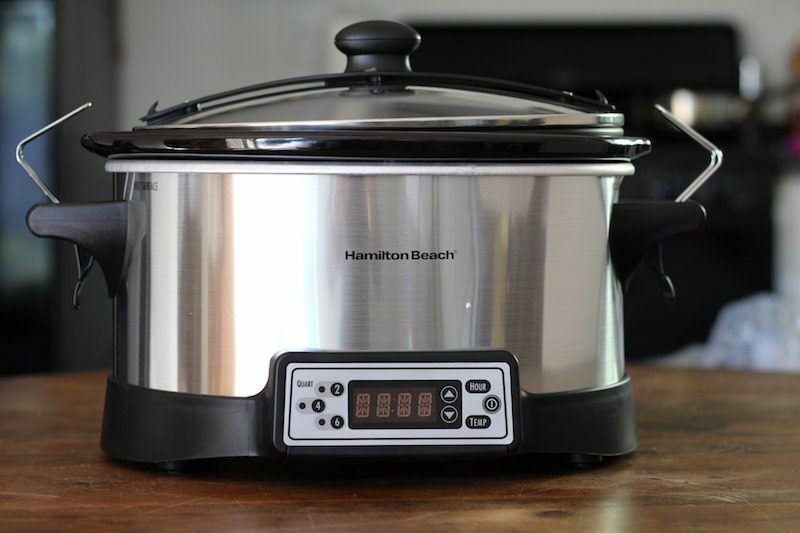 With a locking lid so you can take it on the go, and a programmable timer so you don't have to watch it all day, the Hamilton Beach Right-Size Multi-Quart Slow Cooker Review is a very good value for the price. 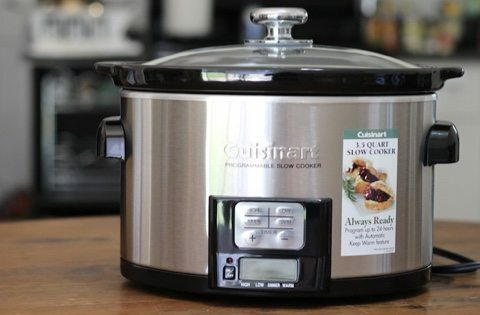 This was an interesting buy for me because this really was the only slow cooker available that claims to be able to make food as a 2, 4, or 6 quart capacity slow cooker. Actually, it was quite difficult acquiring this one. They sent the wrong slow cooker twice, and then Amazon was temporarily out of them so I had to get it second hand. That's why you see the damage in the picture above. But the cooker worked just as fine, and I tested a couple of recipes with different quart sizes to see how it performed. 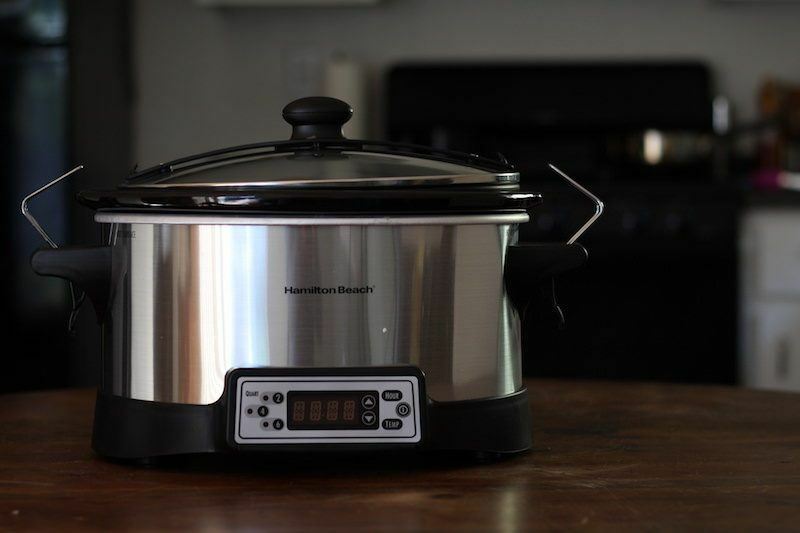 Everything worked quite well, and I actually selected this model to be my #3 pick in the 4-quart mid-priced, AKA small sized slow cookers with a mid-range budget. Though it actually has a six quart capacity, which makes it a bit larger compared to other four quart cookers, the versatility of being able to cook larger dishes was interesting. 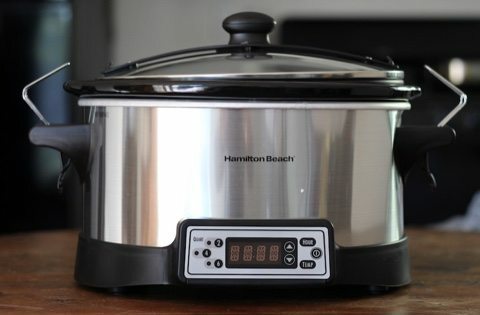 Hamilton beach always makes high quality slow cookers with nice features, and my experience with the Hamilton Beach Right-Size Multi-Quart Slow Cooker did not change that opinion! Also, keep in mind that even though the crock is dishwasher safe, the dishwasher doesn't always do a good job. This appliance also comes with rubber feet to prevent sliding on the countertop, and a brushed stainless steel exterior. This is a step up from the budget models of Hamilton Beach, so you also get a digital timer which is common for this price range of slow cookers. You can set this to a max of 8 hours, then it automatically switches to warm mode, and it can sit like that for a max of 6 hours. 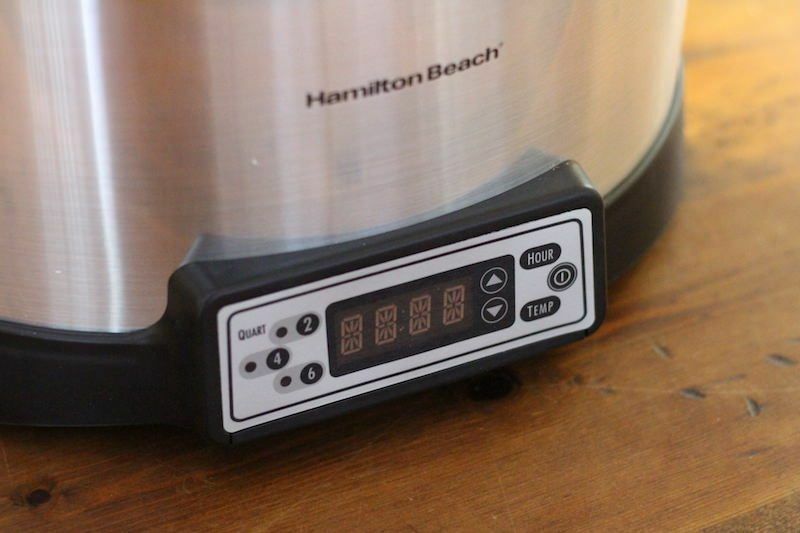 Though not labeled as such, the Hamilton Beach Right-Size Multi-Quart Slow Cooker is actually part of the Stay or Go lineup and has locks to snap down the lid so you can take this slow cooker on the go. Though making a 2-quart dinner probably won't do much for a part event, if you are making something using the 6-quart setting, you could take it to a pot luck at work or to your kid's party event. I'm not a huge fan of the big plastic strip down the middle of the lid with notches for hooking on the clips, and think they have a chance of breaking off with continued use, but that's more of an design complaint, and it doesn't affect the effectiveness of the slow cooker. Of course, the main unique feature of the Right-Size Multi-Cooker is that you can select 2, 4, or 6 quart cooking capacity. Though temperatures are not listed in the manual, we can assume that this has to do with the max temperature the appliance will reach, and possibly the degree of how fast/slow it reaches that temperature. There are marks inside the crock for how full you can fill the crock. Keep in mind, that this will probably be slightly different than other small slow cookers with 2-quart capacity or 4-quart capacity. Usually, a small slow cooker has a much smaller surface area. Here, we're dealing with a large surface area and large container making small meals. Though I did make a recipe using the 4-quart setting, I didn't see a huge difference (probably because I put the correct amount of food). To actually test to see the differences between 2, 4, and 6 quarts I'd have to do a bunch of testing, but I'm not up for that right now. I'll just take them at their word since the two recipes I tested already turned out fine. 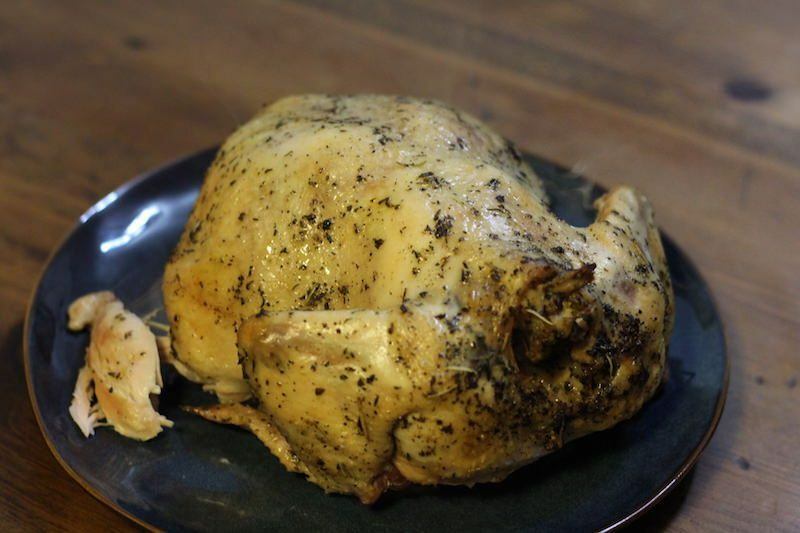 With the six quart capacity I made a whole chicken that cooked for six hours. See below for details! I also cooked a basic 4-quart stew that turned out yummy, but I didn't take any photos. I was in the mood for some lemon pepper herb chicken so that's exactly what I made. 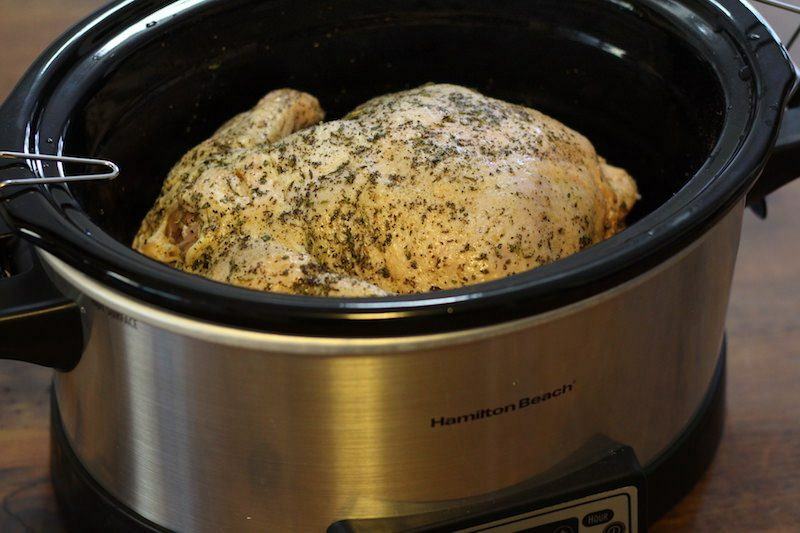 I've made an herb chicken before with the Hamilton Beach Set ‘n Forget Programmable slow cooker. There are pros and cons to using either of them. Firstly, the chicken in the Right-Size Multi-Quart turned out fine. It cooked thoroughly, albeit a bit dry. It was a bit of guesswork to think about how long to cook the chicken all the way through, since I didn't want to be constantly opening and closing the cooker and cutting into the chicken to check for pink spots. Using the Set ‘n Forget model, I was able to just use the included probe to continually test the internal temperature of the chicken and stop when the internal temperature reached 160°. The chicken cooked in that cooker turned out less dry, but there were a few red spots. They were not undercooked, it was just some blood around the bone area, but some people may prefer an overdone chicken to prevent any possibility of consuming undercooked chicken. Anyway, I don't think it reflects poorly on this slow cooker at all. The chicken was tasty, and I could simply adjust the cooking length next time. I just thought it was interesting to compare two different ways of cooking with these two different models. I also learned that browning the chicken in the oven after helps with getting golden, crispy skin rather that soft, watery looking skin. Though most recipes ask you you to brown meat before putting it into the cooker, I think with a whole chicken it's best to do that after. I learned later that you can just stick the crock into the oven for this purpose, but I removed the chicken and put it on a baking sheet. This was not an easy task with a piping hot large chicken, but I managed without hurting myself. The chicken was falling off the bone as I did it though! The one obvious comparison would be to the Set n' Forget style slow cookers which come in five and six quart models. Those come with a temperature probe and digital timer, but no locking lid for transport. 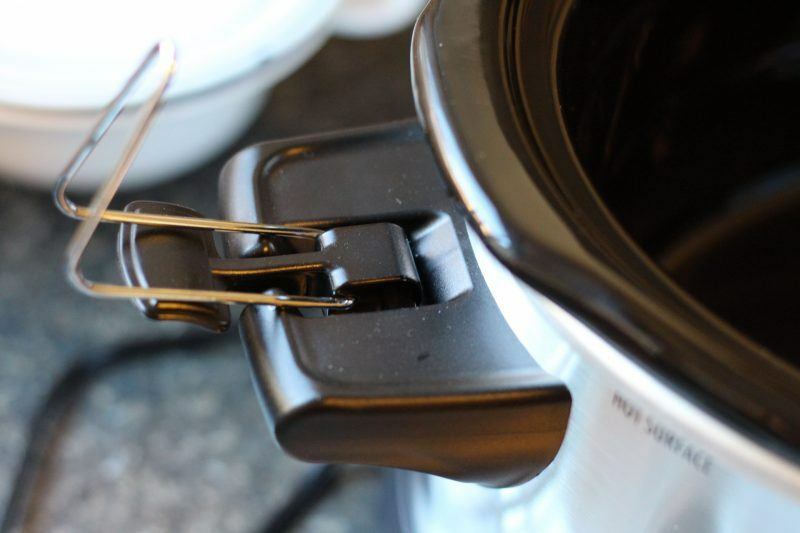 For locking lid style cookers from Hamilton Beach, you need to look at the Stay or Go series. Those consistently make my “top 3” list, and are good to choose from! They come in 4, 5, 6, and 7 quart models, with a variety of manual and programmable. Of course, each of those is best at cooking the amount of food it's designed for. You could buy a six or seven quart model and put less food in it, but you'd have to adjust the cooking time to accommodate, and it may take a few trials to dial it in. You could also compare this to the 4 quart Hamilton Beach, or a 6 quart Hamilton Beach, both of which are part of the Stay or Go style, which include locking lids. They both scored very well, but they are manual models. There are programmable models out there, but I haven't reviewed them yet. The manual ones will be cheaper, costing about thirty dollars, and the programmable ones will be similarly priced to this one, about fifty. So the question you have to answer is, “What am I looking for in a slow cooker?”. If you are confident you'll just be making big meals, then go for a six quart. If you want to pay more for a programmable, go that direction, or you can save some money and go for a manual version. However, the versatility of the Right-Size Multi-Quart Slow Cooker is pretty neat. It means you can make small meals for two, like a dessert or dinner for yourself and another person. 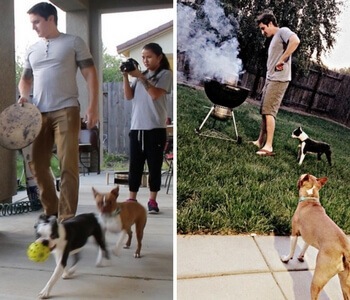 But also allows you to scale up for parties, families, or meal prepping. 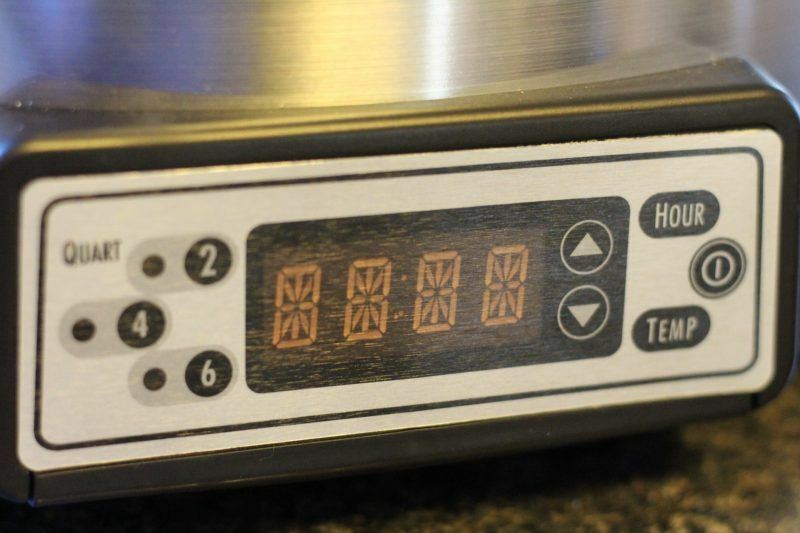 Who Is The Hamilton Beach Right-Size Best For? The Hamilton Beach Right-Size 33642 is best for someone that wants some versatility in their slow cooking meals. As mentioned above, you could possibly make some smaller dessert recipes like cookies, cakes, and puddings with the two or four quart settings. Come on, we don't need six quarts of chocolate cake! But if you're going to spend 8 hours cooking a meal, you might as well make enough for the next day. Plus, those slow cooked ribs go fast anyway. I could probably eat a whole pot to myself. 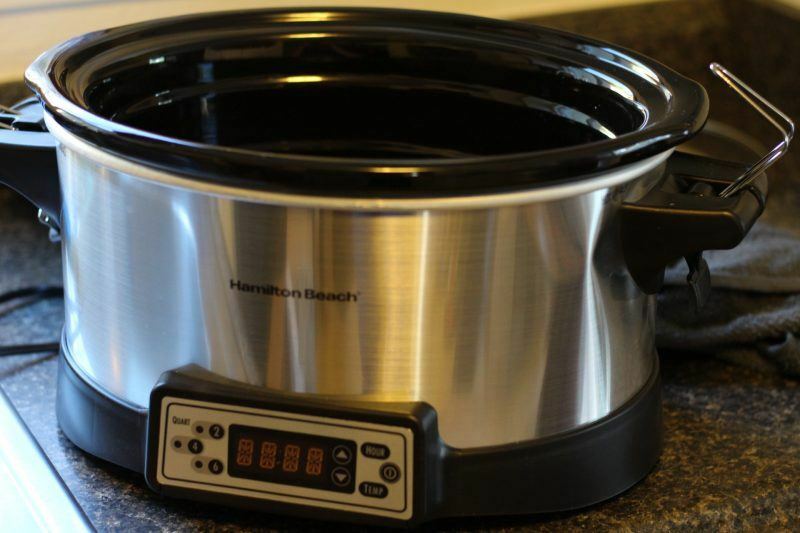 ==> Get The Hamilton Beach Right-Size Multi-Quart Slow Cooker Here! Thank you for the review. I’m torn between the Hamilton Beach Right Size and their (newest?) Set and Forget 6 qt. model #33966C. The C means it’s the Canadian model. I would like to point out that the Right Size model in Canada doesn’t have the lock lid. I live alone and would probably benefit from a 2/4/6 qt. option, but wonder if the probe that comes with the other model might work better in the long run. I am sure most of the time I can fill a 6 qt. the recommended 1/2 full as I love to freeze portions for later use. One thing I can’t figure out is if both models are equal (other than the probe) in regards to the cooking features. Both displays are so different, I have no way of knowing. I’ve even downloaded the manuals for the CDN site but being new to slow cookers, I really can’t figure out the differences. Any help would be appreciated. The cooking features are the same. It’s got a high/low/warm/off setting, and that’s about the extent of what each of these devices do. Both are digital, and made by Hamilton Beach. The advantage of the Right Size cooker is that it has a special setting for each AMOUNT of food you cook. Cooking a 2 quart meal in a 6 quart pot means that it will not cook according to instructions. It may turn out OK, but it may not if the temperature and time needed is very precise. So if you plan to do a variety of large and small meals, then this would be a good choice for you. You’ll also be able to cook whole chickens and roasts in this one exactly as with the Set ‘n Forget model. With the Set ‘n Forget one, the probe is nice for large cuts of meat like roasts and chicken so you can know it’s properly done. However, with most recipes, the amount of time is plenty to cook the food all the way through without worry about over/underdoing the meat. 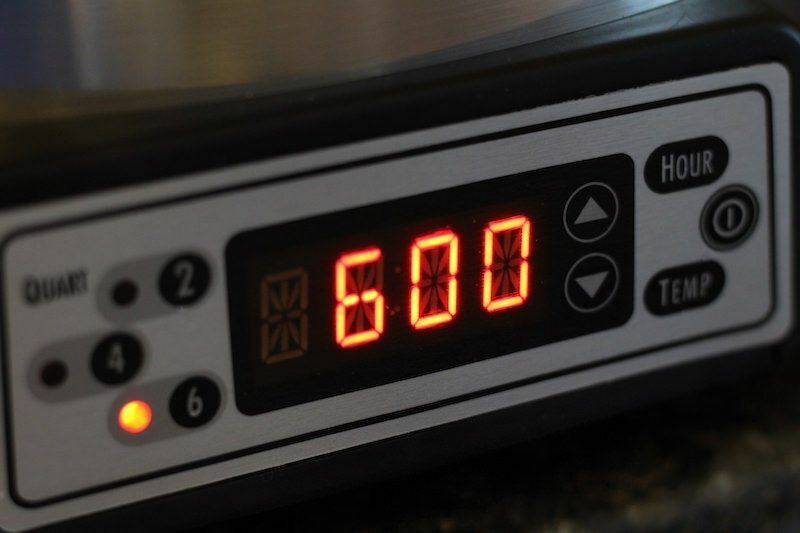 That being said, having a probe is more precise, meaning you can cook it exactly to the right temp, no more, no less. If you plan on doing a lot of roasts and whole chickens, then this would be a good buy. However, for me, I think I would get too lazy to use the probe after some time and would default to using it without that feature. In that case, I’d recommend the Right Size model. If you do like the clips, you should check out Hamilton Beach’s Stay or Go models. I saw a customer review of this model at the Walmart website, where the reviewer suggested using a separately-purchased meat thermometer together with this. 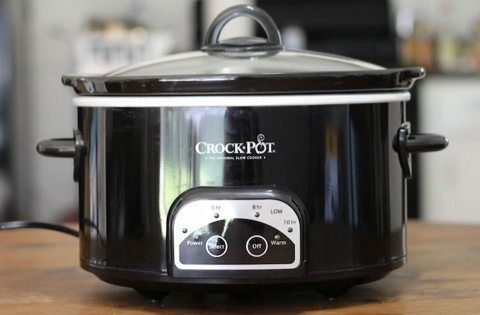 Of course, that combination wouldn’t automatically switch the slow cooker to “keep warm” when the meat hits the right temperature, but it would combine the versatility of the Right Size slow cooker with most of the benefits of the Set & Forget slow cooker.